Pop up banners bring advertisements outside! They are also ideal for indoor events, like a trade show or convention. This popup banner sign collection communicates a message to a target audience. Whether displaying a brand name or logo, descriptive graphic or a clear and decisive directive, these A-frames are a highly-visible method of communicating. The pop up banners have many advantageous features to make them an appropriate choice for on-site outdoor event marketing. Although exceptionally lightweight and portable, they are designed to withstand most moderate outdoor conditions (not recommended for use in high winds or severe weather). Again, the popup banner sign is right at home inside, as well. These versatile items will be the cornerstone of your on-site marketing & advertising campaigns! Could these advertising displays, pop up banners help your company? They are completely customizable so the exact message that is intended gets across to potential customers, patrons or clients. Each popup banner sign is digitally printed for high quality, vibrant, customized graphics! Many types of printing places restrictions on the type of artwork customers can submit. For example, vector-based graphics allow only certain colors, simple shapes and minimum graphic sizes. Digital printing is like printing directly off a printer at home or in the office. Images can be simple or detailed, feature solid colors or gradients, and can be as large or small as needed. There is an endless rainbow of colors to choose from when designing the banner signs. Although the limits with digital printing are few and far between, it is always good to keep your audience in mind. How close will they be to the popup banners? Will this hinder their ability to recognize and process small images or similar colors? Users should remember that the simpler the message, the more likely your target market is to absorb and retain the information. What Is The Artwork Submission Process For A Popup Banner? Where Can Pop Up Banner Signs Be Used? Sporting Field Events – soccer, basketball, field hockey, baseball, softball or football tournaments, gymnastics meets, cheerleading/dance competitions, cross-country or track events, tennis matches & more! Tradeshows are great place to use these popups. Trade show environments are all about which company can catch the attention of passersby the quickest and most effectively. In order to do so, companies must find the right product so their booth stands out against the crowd! Some common trade show "eye-catchers" include retractable stands, multi-panel fabric popups, ceiling-mount graphics and more. The problem is that those all come with a hefty price tag and are quite simply, a pain to deal with. These A-frame stands are cost-effective and exceptionally portable. In fact, portability is one of the largest selling points of trade show items. Various trips in and out of the venue or hall are inevitable, but the more one can carry in a single trip, the better! These lightweight, collapsible banner signs are an excellent choice for trade show exhibitors! Although these popups work great indoors, they are really designed for outdoor use in places like sports fields, golf courses or track sidelines! Considering their very lightweight design, one might think that the pop up banner signs could not stand up outside. That is not the case, however. These are crafted specifically with outdoor use in mind. 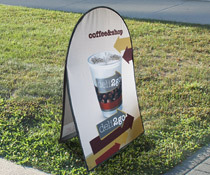 The base framework of these banner signs is flexible fiberglass poles. The graphic portion is crafted from mesh polyester fabric. This semi-permeable fabric allows slight wind passage so the A-frames do not just blow right over. Black polyester pockets secure the graphic to the fiberglass poles. Each unit also has distancing straps and touch fastener security straps. 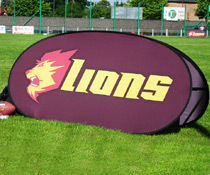 These are used to both keep the pop up banners upright, as well as provide a stable base. Galvanized steel stakes are included with each A-frame. These are stuck through metal rings to secure the signs to the ground on soft surfaces, like soil, sand, grass or snow. On harder surfaces, like asphalt, pavement, concrete or artificial turf, it is recommended to place water or sand bags (not included) across the distancing straps for security. 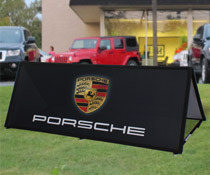 Collapsible pop-up banner signs are available in 5 different styles. Four of them are oval-shaped and one is rectangular. 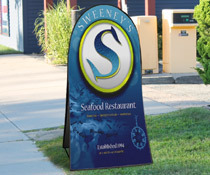 Oval displays are the more traditional style for these outdoor advertisers. They are commonly seen at car shows, county fairs, golf tournaments, sports sidelines and more! These are available in a multitude of sizes, from a small (even ideal for tabletop use) 47" wide x 27" high sign to an extra-large 107" wide by 53" high display. Other oval sizes available include 78" wide x 39" tall and 98"wide x 39" high. The rectangular tent-shaped folding banner is unique in its shape. While it is, of course, a rather standard shape, it is used less often in this outdoor advertising application. It does however, provide unique opportunities for advertising. These can be placed side by side with no gaps between the displays, creating a solid wall of advertisements, ideal for track or sports field sidelines. This allows customers to repeat a logo, slogan or message over and over again, or to create a sort of mural effect (we do not recommend trying to print a continuous image across various stands, but rather a running phrase, or alternating phrases/images). Perhaps the grandest shopper of these non-retractable, digital-printing marketing & advertising pop up banner signs is large companies. This is because these businesses often sponsor special events where the stands are used. They buy in bulk and either ship the frames to event staff or send their own employees to set them up. Corporate sponsorship is the driving force behind many of the special events we see all around us. From professional athletic games to county fairs, these events probably would not be taking place if there were not big corporations writing a check. It is widely known, however, that companies do not generally do this simply for charity. They are in business, after all. They are looking for a return on their investment. One of the only methods of attaining this at such events, is by advertising to attendees. Corporate sponsor names are on everything from brochures to programs. They are being mentioned on television and radio ads. And one can bet that their names will be plastered throughout the entire event itself. Companies need easy to setup and disassemble lightweight, portable merchandise to set up and take down quickly and easily. 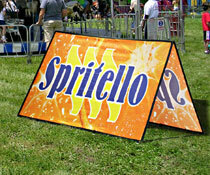 These non-retractable, folding, collapsible pop up signs with limitless colors are the answer. Although they look (and are) quite large, each folds down flat to about half its expanded dimensions and fits into a convenient carrying bag. The grandest of the collapsible fabric frames weighs under ten pounds in the carrying bag with the included galvanized steel stakes! These popups are just a small portion of the huge selection of outdoor special event flags designed to reach a target audience. There are even more styles available, including retractable stands, street post displays and more! Displays2go is a leading provider of customizable point-of-purchase merchandise, as well as stock items. The company has been in business for over 40 years and prides itself on a huge selection of objects, short lead times, friendly, knowledgeable customer service, and high quality items. Although these digitally-printed, non-retractable items do take a bit longer to ship, they are well worth the wait. If your business is in need of items quickly, check out the home shopping page where 90% of what you find is in stock & ready to ship today if ordered before 3PM EST! This is the ideal place to find displays!